One of New York's most popular ice cream shops just got a lot bigger and tastier. 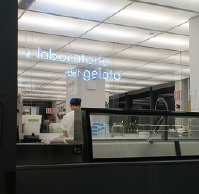 Jon Snyder's il Laboratorio del Gelato setting up shop in a huge space at the corner of Ludlow and East Houston Street. I call it ice cream heaven with its stark white walls and stainless steel counters. Unlike the original shop on Orchard St, which is still open, here you can get the full monty; a taste of almost every flavor il Laboratorio has to offer. 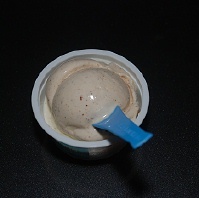 Flavors like blueberry, bourbon pecan, honeycrisp apple, chestnut honey, Greek coffee, kiwi, tangerine and watermelon. 150 flavors in all of gelato and sorbet. All of these choices, of course, make picking a flavor quite difficult, and at $4.25 for two small scoops, you'd better make your picks wisely. The good new is the staff is very helpful and will give you a few free tastes if you have trouble deciding. After much thought, and wanting to try something different, I opted for the toasted sesame. It was rich and almost smoky. My second choice was Mexican cinnamon, lively and bold, and the combination of the two created a symphony for the senses. Next up: blood orange and lemon rosemary.